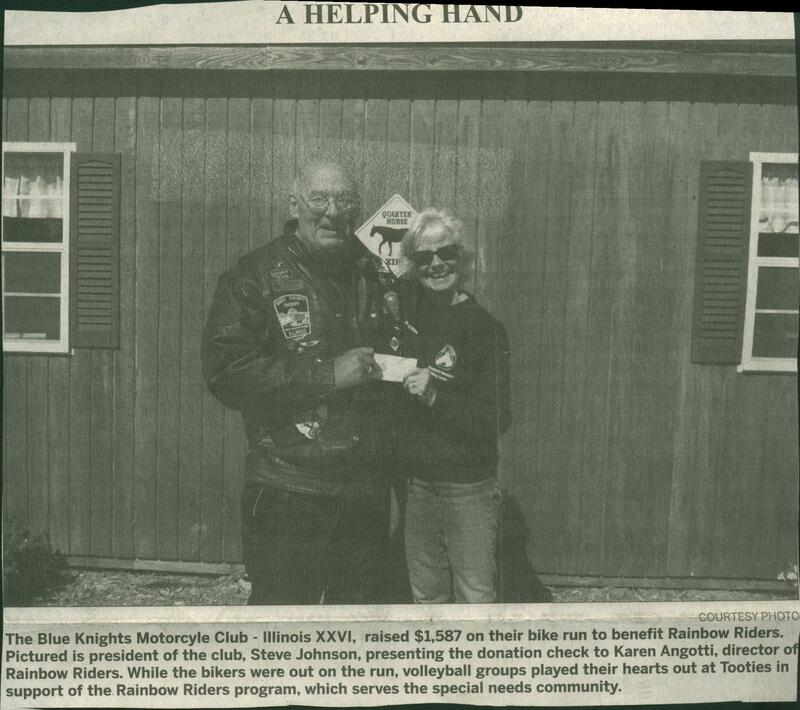 Throughout the years, several businesses and individuals have helped Karen and Rainbow Riders by providing them with numerous donations. 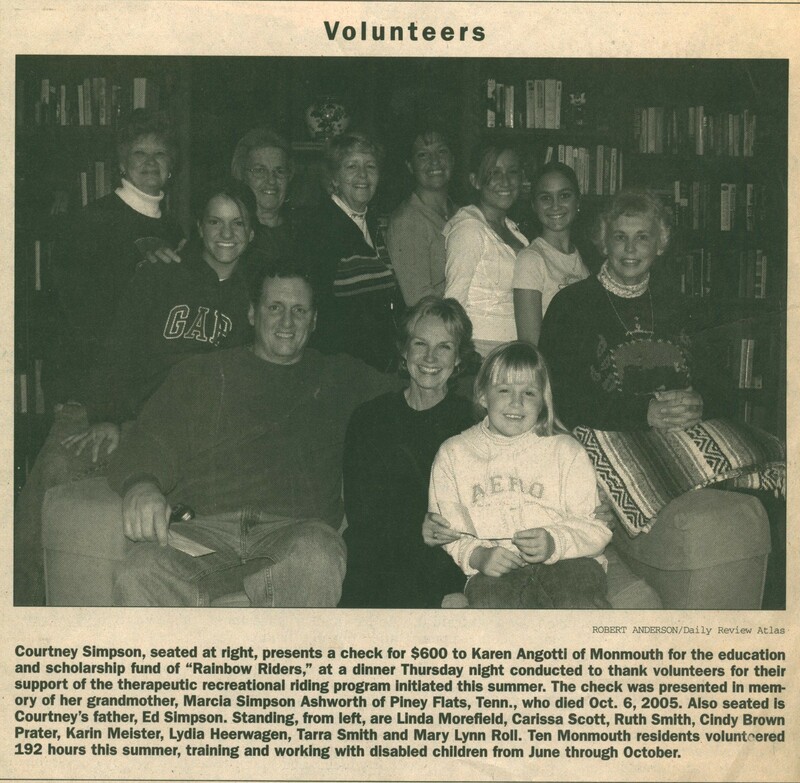 Some of these include: NBC news anchor Tom Brokaw, the Blue Knights Motorcycle Club, the Lions Club, Courtney Simpson, the local Delta Kappa Gamma Chapter, Alpha Rho, Country Financial, Lowe's Heroes, Elizabeth Wrage and Robin Johnson, the Monmouth Kiwanis Club, First Lutheran Church, and Market Alley Wines. Without all of these incredible donations, the impact and opportunities Rainbow Riders has given to the Monmouth community would not have been possible. Due to the close-knit and smaller size of Monmouth, many businesses and organizations rely heavily on donations from the community. An article written in the Daily Review Atlas in Monmouth describing how a well-known NBC News Anchor, Tom Brokaw had donated a saddle to the organization to be auctioned off at a fundraiser. 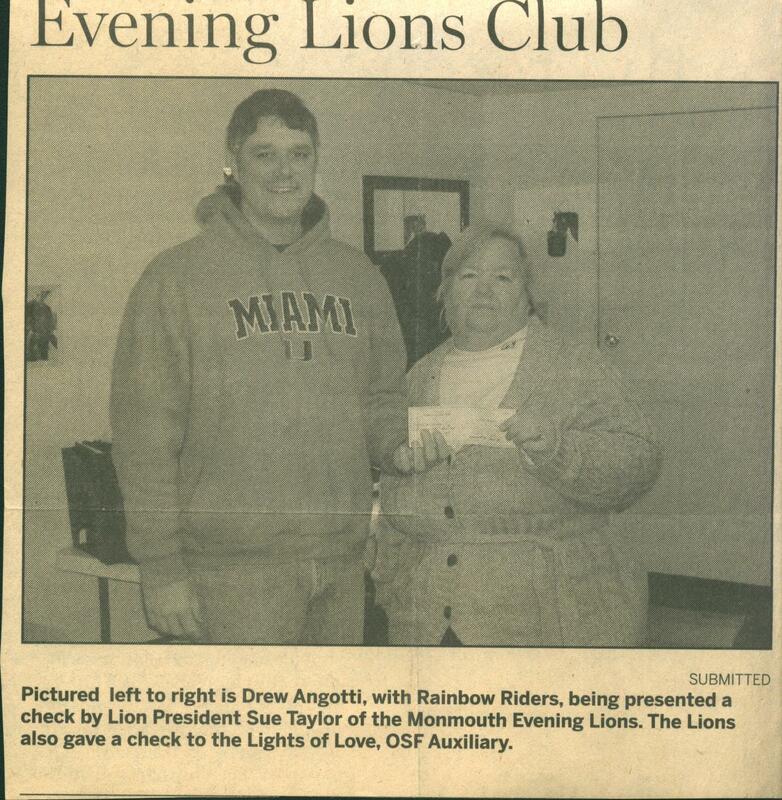 Drew Angotti receives a donation on behalf of Rainbow Riders from the Evening Lions Club. Courtney Simpson donates to the education and scholarship fund of Rainbow Riders. The Blue Knights Motorcycle Club raised money on their bike run and gave the proceeds to Rainbow Riders. 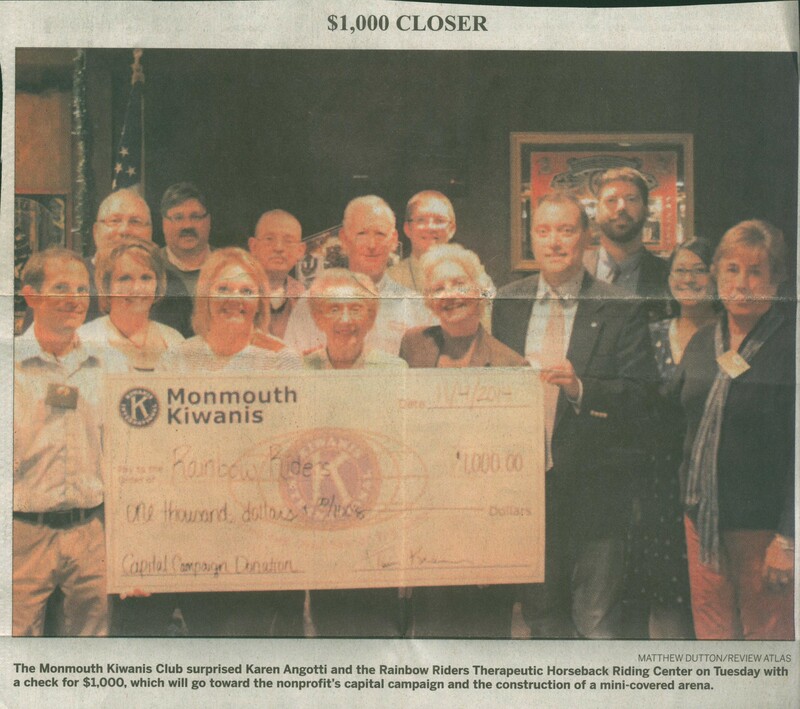 The Monmouth Kiwani Club donates a check to Rainbow Riders to go towards capital campaign and construction of the arena. 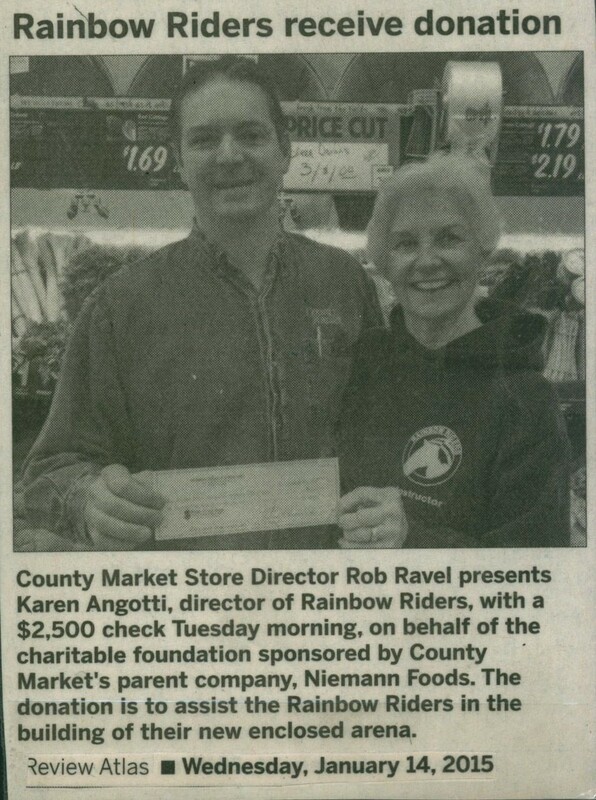 County Market presents a check to Karen Angotti for the construction of the Rainbow Riders' Arena. 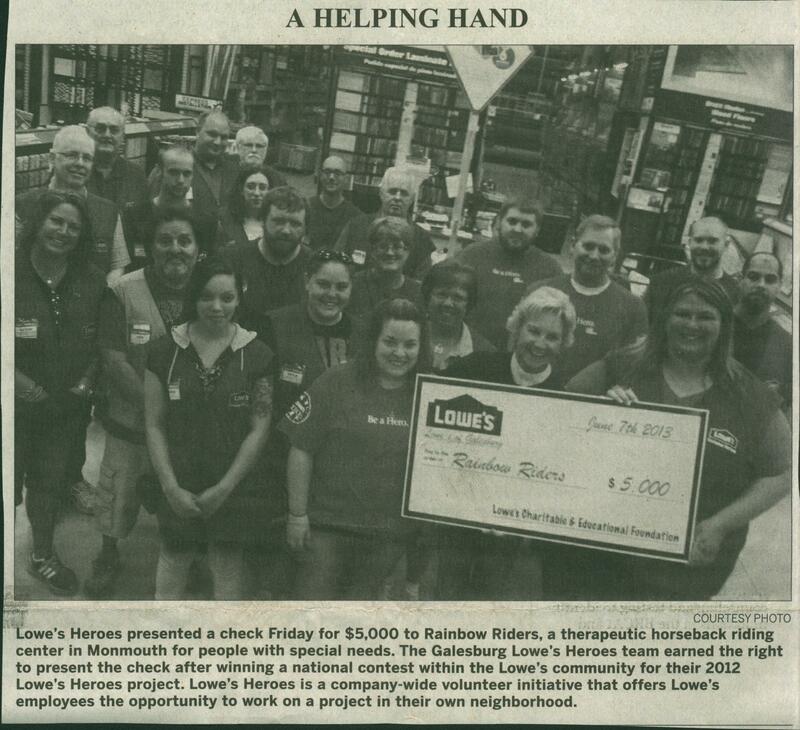 Lowe's Heroes provides donation to Rainbow Riders. Country Financial donated to Rainbow Riders in order to honor their employee, Tiffany Cole, and all the volunteer work she gives the therapeutic program. 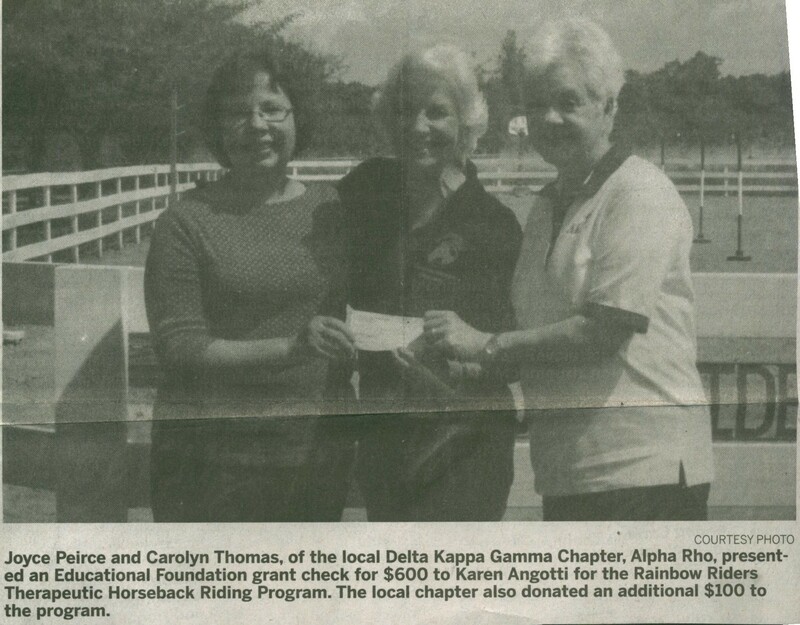 The local chapter of Delta Kappa Gamma, Alpha Rho, donates a check to Rainbow Riders. 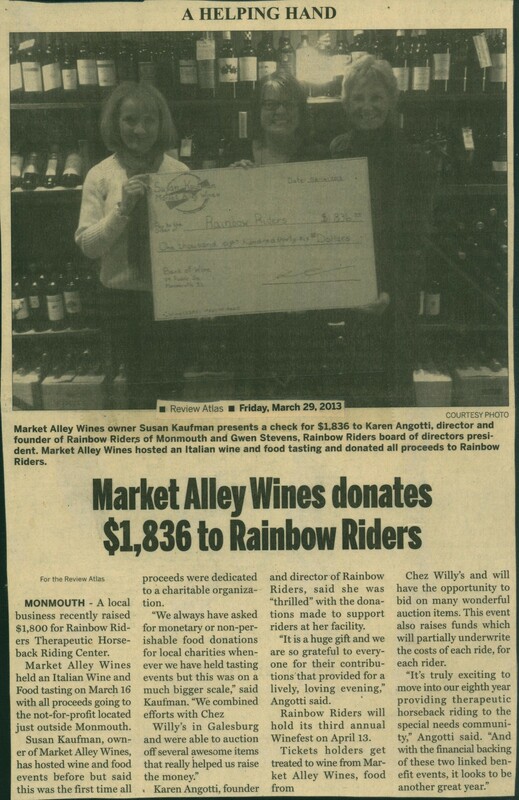 Market Alley Wines raises money to help with Rainbow Riders. 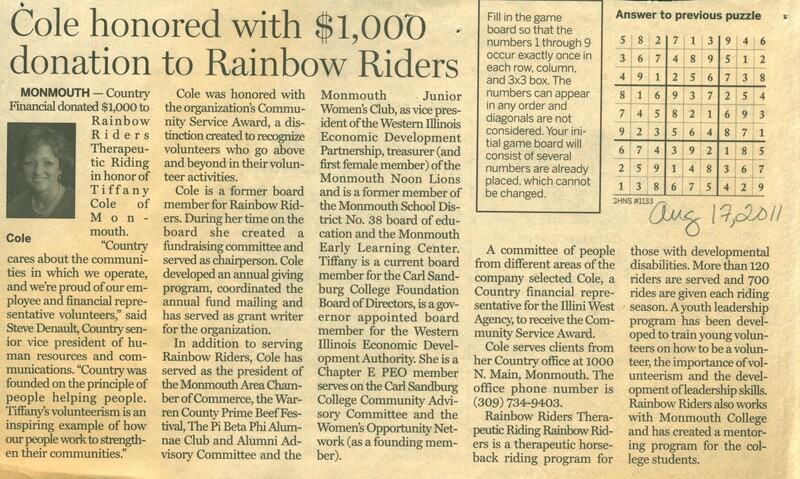 An article written in the Daily Review Atlas showing the level of success Rainbow Riders had reached four years after opening. Much of the success is from the help of the community in donations and members of the community donating their time. 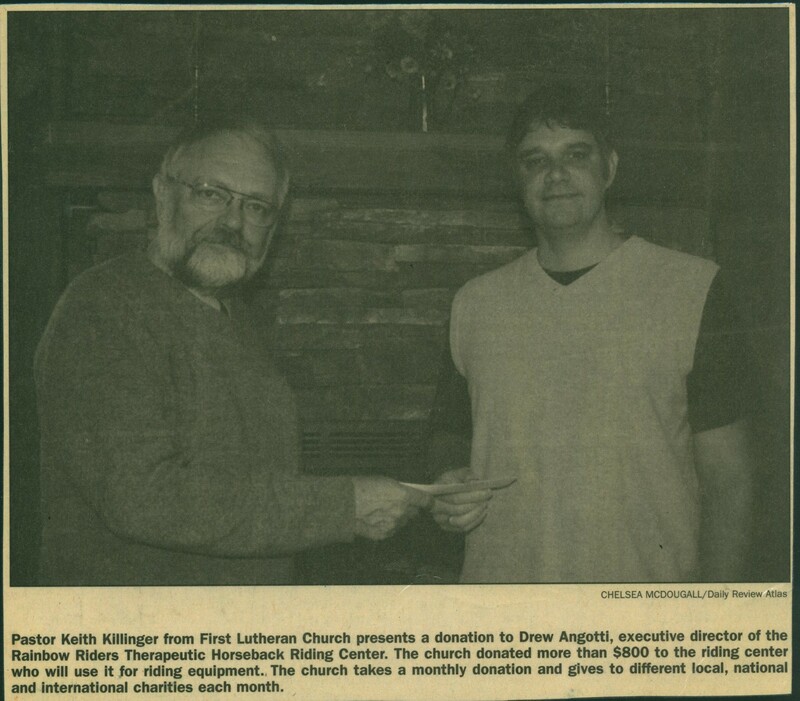 This image is from the Daily Review Atlas article and shows Karen's son, Drew Angotti, accepting a donation for Rainbow Riders from the First Lutheran Church.